I always distrusted internet buying, i had been told about people being conned online, however a friend referred me to SBT Zimbabwe offices where i met friendly staff who assisted me. they helped me to choose a car that was the best within my budget and also in great condition, they assisted from the day i chose the car right up to the moment i drove away, all options for importing were laid down for me to choose the viable one, they even pre calculated my import duty and other expenses related to importing from japan. 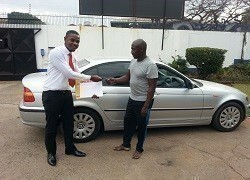 THANK YOU SBT GLOBAL CAR EXPORTER, I RECEIVED MY CAR IN PERFECT CONDITION.